St. Nicholas, the chosen of God, was in his own lifetime a great wonder-worker of miracles, and this continues to this day. He was born in Patara, later entering into the Monastery of New Zion founded by his uncle Nicholas, who was also the bishop of Patara. He wanted to live a life of solitude and silence, but heard a Heavenly voice calling him, “Nicholas, for your ascetic labor, work among the people if you desire a crown from Me.” Shortly after this, he was chosen by revelation to be the Bishop of Myra in Lycia of Asia Minor, now in modern day Turkey. Generous with his goods and life, fearless before earthly powers in matters of righteousness, zealous for the faith, and truthful, St. Nicholas was a lover of justice, and on two occasions defended three innocent men condemned to death. He appeared even while alive in dreams and in person to those who called on him in need, and is known to be “quick to help.” He is the patron of travelers, those at sea, students, and even pawnbrokers. 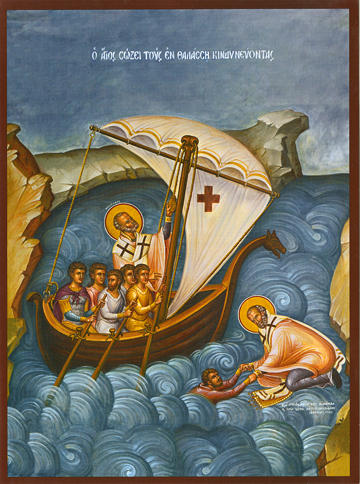 Loved throughout the world, here he is shown guiding sailors and saving one fallen into the sea. St. Nicholas died on December 6, 343.